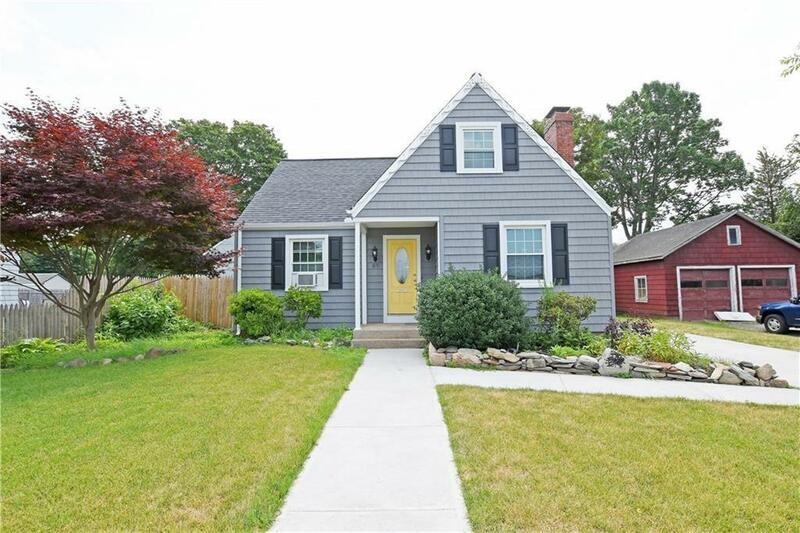 PICTURE PERFECT AND SPACIOUS CAPE COD HOME IN THE HEART OF EAST PROVIDENCE. THIS HOME FEATURES A BRIGHT DECOR AND SO MANY UPDATES! A LARGE UPDATED EAT IN KITCHEN OPEN TO DINING AREA WITH ACCESS TO PRIVATE PARK LIKE BACK YARD, PRETTY FIRE PLACED LIVING ROOM, 2 UPDATED FULL BATHS, ONE ON EACH LEVEL FOR ADDED CONVENIENCE AND 4 GOOD SIZED BEDROOMS! HARDWOODS, AMPLE CLOSETS AND 2 FIRST FLOOR BEDS FOR ANYONE WANTING ONE LEVEL LIVING. HOME HAS VINYL SHINGLES AND WINDOWS BY MARSHALL. BEAUTIFUL LANDSCAPING. LOCATED IN AN EASY COMMUTING AND WALKING AREA AND VERY CONVENIENT TO PROVIDENCE AND THE EAST SIDE!